If you have had the same set of tires for a few years now, the original black color of them may have worn off a bit by now. You don't have to rush out to the store to invest in new tires, but a few products can help bring your tires back up to their original look. 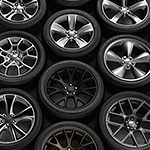 You'll want to make sure that you invest in products that are designed for your tires only. Auto body soap and wax weren't designed for the rubber of your tires. When you start the process of cleaning your tires, you'll want to move your vehicle into the street. You could stain your driveway if you complete this process there. Start with cleaning your tires and rinsing them thoroughly. They should dry completely before you use another product like tire gel or tire black.